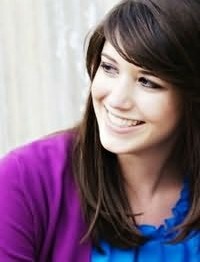 Author Alexandra Bracken (BRIGHTLY WOVEN) has THE DARKEST MINDS (previously titled BLACK IS THE COLOR) coming out with Hyperion in December 2012. I am super pumped to get my hands on this one - especially after reading Alexandra's wise answers. I know a very popular answer to this question is that dark stories allow readers to experience horrifying events and harrowing peril in a “safe” way (at least, you know, in the sense that always close the book if they need to escape it). For a few hours or days, they can be involved in a kind of imaginative suffering that’s either personally therapeutic or enlightening about humanity/themselves/their government/etc. But… I don’t know. I don’t think there’s one simple, neat explanation. Storytelling-wise, I think dark stories appeal to readers because they often feature very high-stakes situations, and those make for exciting reads. I know that, personally, I grew up in a very safe, happy environment, but I read books about war and death and oppression and addiction because I wanted to peer into the darkness outside of my own little bubble. If you think about it, though, the dystopian genre naturally lends itself very well to YA; any “coming of age” story is underscored by the main character trying to figure out his or her place in the world as they gain independence and start creeping toward adulthood. The character’s perspective changes. They begin to ask questions, take up causes. The same government that seemed benevolent and perfect to them as a child begins to show cracks in its veneer. Coming to terms with the fact that the world isn’t—hasn’t been and maybe will never be—a completely safe place is a huge part of shifting out of childhood, and something that almost everyone can relate to. If THE DARKEST MINDS had a theme song, what would it be and why? I’m a little torn, here, because classic rock plays a minor role in the story and it feels wrong not to choose one of those songs, but I think I have to go with “Suburban War” by Arcade Fire. I’m so lucky The Suburbs came out when it did—it was the perfect writing soundtrack for a story about kids who, essentially, have been forced out of their idyllic suburban lives years and years before they ever should have. For me, this song captures that strange, lonely feeling you get when you try to go home again after being away for a time. You look around and see familiar places and old friends, but you can’t quite figure out if they’ve changed, or, in growing up, you’ve changed to the point that you no longer fit into their world. Also: super gorgeous, vaguely apocalyptic lyrics! What fictional character from another book would Ruby chose as her best friend and why? Ooohh, this is a tough question! The problem I’m having is that Young Ruby is very different than Teenage Ruby. The latter, I’m sorry to say, is pretty battered emotionally… to the point she actively tries to not have friends. I can see Young Ruby being BFFs with Jo March from Little Women, though. They’re both tomboys, fairly blunt, a tiny bit clumsy, and voracious readers. I imagine they would have gotten into a lot of trouble with one another! When I finished reading this for the first time, I was filled with a kind of rage and despair that had me side-eyeing everyone and everything. It was the first “true” dystopian book I’d ever read, and very few have lived up to it in my mind. This book made a huge impression on me as a teenager, and to this day I still count it as one of my absolute favorites. The last line slays me every time: “The creatures outside looked from pig to man, and from man to pig, and from pig to man again; but already it was impossible to say which was which.” Nightmares forever, y’all. Nightmares forever. If you’ve only seen the movie Blade Runner, you’re missing out! I find it sad that I haven't read any of those classic dystopians. Okay, I'm pumped for this now. I really enjoyed Brightly Woven and can't wait to see what Alexandra brings in Black is the Color. Sounds great. I love the sound of her book - Black is the colour! It's the first time that I've heard of it, but it certainly is one that will be going on my wishlist! I loved BRIGHTLY WOVEN, so BLACK IS THE COLOR is one of my most anticipated book of next year. However, if it weren't, I'd definitely be excited for it after this interview! I'd never heard of this book before, but it's definitely on my radar now. Great interview! Oooh, she recommends classics for her favorite dystopias! This book sounds great -- just added it to my TBR list! Excellent interview, too. Her dystopian list is quite similar to my faves. I read Animal Farm quite young, and it really creeped me out (especially that ending!) And Black is the Color sounds like it's full of action and excitement - awesome! I am so excited for BLACK IS THE COLOR! BRIGHTLY WOVEN was absolutely enchanting and I cannot wait to read more from Bracken. Thanks for the great interview, Lenore! Oh, yes yes yes on Jo March! Perfect. :O) Thanks for the interview! I'm so crazy excited about Black is the Color (like everyone else here, apparently). Brightly Woven was such a breath of fresh air. I can't wait to see what Bracken does with her next book! Ha! Love the Empire State Building wish. And any character who would have Jo as a BFF is a friend of mine too. I have never considered the fact that darker seem more exciting because of the high-stakes situations in them, but it makes sense. I also agree with Alexandria's statement on why so dystopians and YA go hand in hand. Very nice interview. Gave me a lot to think about! Love all the previews! I hadn't heard of this book, but the summary sounds awesome! Great interview! I saw a lot of promise in Brightly Woven, and I'm really looking forward to Bracken's next book. I enjoyed Brightly Woven so I suspect I'll like Black is the Color too. Looking forward to it.